And Samson went down to Timnath, and saw a woman in Timnath of the daughters of the Philistines. And he came up, and told his father and his mother, and said, I have seen a woman in Timnath of the daughters of the Philistines: now therefore get her for me to wife. 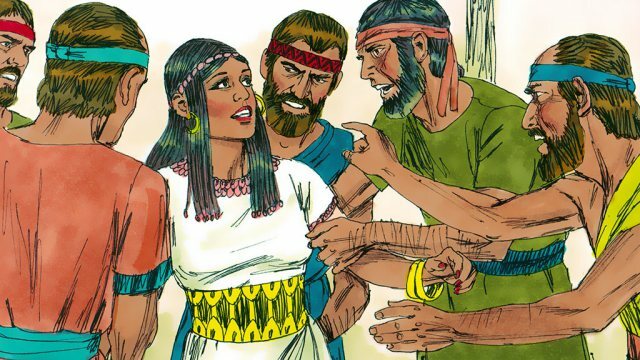 Then his father and his mother said to him, Is there never a woman among the daughters of your brothers, or among all my people, that you go to take a wife of the uncircumcised Philistines? And Samson said to his father, Get her for me; for she pleases me well. But his father and his mother knew not that it was of the LORD, that he sought an occasion against the Philistines: for at that time the Philistines had dominion over Israel. Then went Samson down, and his father and his mother, to Timnath, and came to the vineyards of Timnath: and, behold, a young lion roared against him. And the Spirit of the LORD came mightily on him, and he rent him as he would have rent a kid, and he had nothing in his hand: but he told not his father or his mother what he had done. And he went down, and talked with the woman; and she pleased Samson well. And after a time he returned to take her, and he turned aside to see the carcass of the lion: and, behold, there was a swarm of bees and honey in the carcass of the lion. And he took thereof in his hands, and went on eating, and came to his father and mother, and he gave them, and they did eat: but he told not them that he had taken the honey out of the carcass of the lion. So his father went down to the woman: and Samson made there a feast; for so used the young men to do. And it came to pass, when they saw him, that they brought thirty companions to be with him. And Samson said to them, I will now put forth a riddle to you: if you can certainly declare it me within the seven days of the feast, and find it out, then I will give you thirty sheets and thirty change of garments: But if you cannot declare it me, then shall you give me thirty sheets and thirty change of garments. And they said to him, Put forth your riddle, that we may hear it. And he said to them, Out of the eater came forth meat, and out of the strong came forth sweetness. And they could not in three days expound the riddle. And it came to pass on the seventh day, that they said to Samson’s wife, Entice your husband, that he may declare to us the riddle, lest we burn you and your father’s house with fire: have you called us to take that we have? is it not so? And Samson’s wife wept before him, and said, You do but hate me, and love me not: you have put forth a riddle to the children of my people, and have not told it me. And he said to her, Behold, I have not told it my father nor my mother, and shall I tell it you? And she wept before him the seven days, while their feast lasted: and it came to pass on the seventh day, that he told her, because she lay sore on him: and she told the riddle to the children of her people. And the men of the city said to him on the seventh day before the sun went down, What is sweeter than honey? And what is stronger than a lion? and he said to them, If you had not plowed with my heifer, you had not found out my riddle. And the Spirit of the LORD came on him, and he went down to Ashkelon, and slew thirty men of them, and took their spoil, and gave change of garments to them which expounded the riddle. And his anger was kindled, and he went up to his father’s house. But Samson’s wife was given to his companion, whom he had used as his friend. The Sun Stands Still (Joshua 10:12-15) Then spoke Joshua to the LORD in the day when the LORD delivered up the Amorites before the children of Israel, and he said in the sight of Israel, Sun, stand you still on Gibeon; and you, Moon, in the valley of Ajalon. And..
Israel Defeated at Ai (Joshua 7:1-15) But the children of Israel committed a trespass in the accursed thing: for Achan, the son of Carmi, the son of Zabdi, the son of Zerah, of the tribe of Judah, took of the accursed thing: and the anger of the LORD was kindled..
Midian Oppresses Israel (Judges 6:1-10) And the children of Israel did evil in the sight of the LORD: and the LORD delivered them into the hand of Midian seven years. And the hand of Midian prevailed against Israel: and because of the Midianites the children of Israel made them the.. The Walls of Jericho Joshua 6:1-21 Now Jericho was straightly shut up because of the children of Israel: none went out, and none came in. And the LORD said to Joshua, See, I have given into your hand Jericho, and the king thereof, and the mighty men of valor. And..